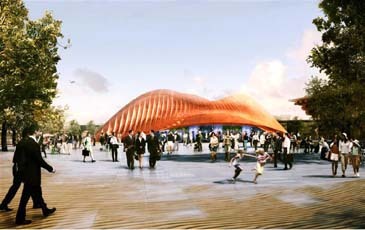 This is the artist's conception of UAE pavilion at EXPO 2010 Shanghai. A pavilion like no other, is how the imaginative and appealing structure for the United Arab Emirates' pavilion was described on Nov. 29 by HE Saqr Gobash, UAE Minister of Labour and Chairman of the National Media Council (NMC), at the official launch of the country's participation at Expo 2010 - the largest ever World Exposition event, scheduled to open on May 1st 2010 in Shanghai. The event is expected to attract over 60 million visitors from all over the world during a period of six months. Designed by Foster Partners, one of the world's leading architectural teams, the building will be the first ever truly recyclable Expo pavilion. Following completion of Expo it will be dismantled and moved to a more permanent location, thus gaining maximum value from the extensive planning, design and construction that is involved in Expo participation. The building's strong appeal lies not just in its unusual organic form but also in the reflective nature of its outer covering, helping to recreate the changing patterns and colours of the UAE's natural and urban environments. Diffused light penetrates the building during the day and spectacularly illuminates the pavilion by night, Gobash elaborated. Meanwhile, Deputy Chairman of the National Media Council and the Commissioner General of UAE Pavilion at Expo 2010 Salem Al Amiri said that in keeping with the theme of the event, the building will demonstrate a number of innovative environmental strategies including the UAE's ambitious sustainable agenda programme. The unique pavilion is considered as a beacon for such principles, its hi-tech form an expression of the passive environmental measures it employs. Shaped by the wind, a natural dune appears rough on the side that bears the full force of the wind, and smooth on the side that collects the sand after it has been tipped over the ridge. The design seeks to replicate this, deflecting the Shanghai winds and protecting the smooth, leeward side, added the Commissioner General. The curve of the dune responds to the arc of the sun and is orientated towards the north, with the solid shell forms protecting against the direct glare from the south and allowing indirect light to enter the habitable areas via a complex series of louvres. The slopes rise to 20 metres in height to enclose the exhibition spaces within and arched entrances protected by canopies shelter visitors as they queue to enter the building. The outer finish is rosy gold-coloured stainless steel designed to shimmer in the changing light. The UAE pavilion is located in the eastern section of the Expo site, south of the river and within easy reach of the Chinese pavilion on the opposite side of the main thoroughfare. It is approached via an entrance along the south ring road, across the elevated Expo walkway and is oriented to address a public square in the north-east corner of the site. Situated on largest plot size (6000 square metres) available to Expo participants, The Dunes, as the building has become known, has a footprint of 3452 square metres and encloses a total of approximately 3900 square metres of exhibition space, information areas, and other facilities, Al Amiri added. The overall installation is a celebration of city living in the UAE - the swiftness with which the nation has built modern cities and, with the resources that they are investing in sustainable technology, their global leadership in helping us all to live better in the cities of tomorrow. Visitors will approach The Dunes by a walkway, which has seating and follows a stream of water towards the entrance. Proverbs and quotations along the route will gradually immerse people into the ideas and themes of the exhibition. Entering the pavilion, visitors will be presented with a short film, taking them from the birth of the UAE to today. Next they will enter a large space where reactive technology and AV is used to present the daily lives of an Emirati family. From there, moving into a large, darkened theatre space, visitors will be taken on a simulated ?dream journey' to the UAE, showcasing its many magnificent attractions. The final area of the pavilion provides visitors with a wide range of information on the country. After leaving the building they will find comfortable, shaded seating where they can relax and contemplate.